This site is the archive for the exhibition, Dark Euphoria – Unclassified Media, by media artist Mitch Goodwin. 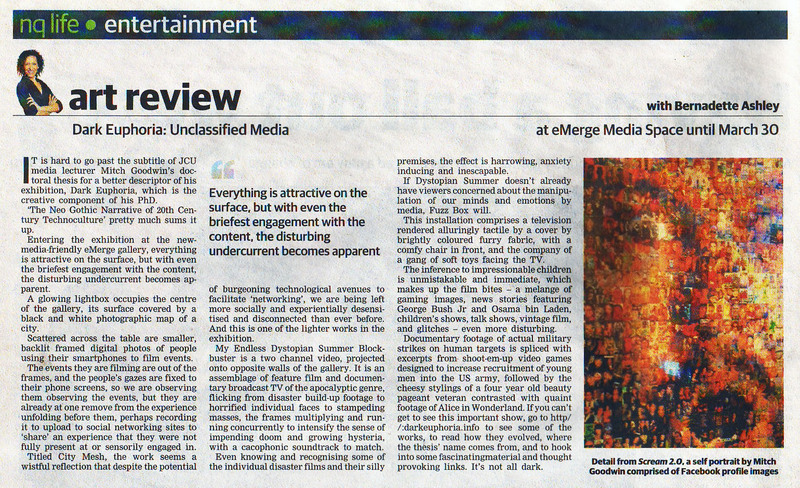 The exhibition was staged at the eMerge Media Space in Townsville, between Friday October 21 2011 and Friday March 30 2012. The exhibition is the creative component of Goodwin’s Doctoral studies into the neo-gothic narrative of millennial technoculture. The exhibition component is an exploration of the darker tendencies of the contemporary digital aesthetic and the larger meta-narrative of the mass media network in this period of millennial change. The exhibition featured photography, video remixes of contemporary screen culture, multi-channel video works, image manipulation, glitch art and electronic music. Further musings, rants, stumbles and pop snippets can be found at the artist’s blog site, Screen Culture. “In gothic high tech, you’re Steve Jobs and you’ve built an iPhone, which is a brilliant technical innovation, but you also had to sneak off to Tennessee to get a liver transplant because you’re dying of something secret and horrible. You’re a captain of American industry. You’re not like, you know, some General Motors kind of guy. On the contrary, your guy is really kind of like got both hands on the steering wheel of a functional car, but you know, you’re still gothic high tech because, you know, death is waiting, and you know not a sort of kindly death either but a really kind of sinister, creeping, tainted wells of Silicon Valley kind of super fun thing that steals upon you month by month that you have to hide from the public, from the bloggers, and from the shareholders. You just kind of grit your teeth and pull out the next one. A heroic story really, but very gothic. (Sterling 2009). To access the whole keynote visit the Reboot 11 site for the video and Sterling’s Wired blog, Beyond the Beyond, for the transcript. Citing Paul Virilio, Zygmunt Bauman, Slavov Zizek and futurist/sci-fi author Bruce Sterling, the works on display form the creative component of Mitch Goodwin’s phd thesis, Dark Euphoria: The Neo-Gothic Narrative of Millennial Culture. Visitors to the media space will not be provided with a traditional printed catalogue but rather each work will be accompanied by a didactic featuring a QR Code and four images illustrating the aesthetic – and cultural – progression of the work. The didactic’s QR code will point the viewer to the particular work’s page on this blog site, (see main menu above). 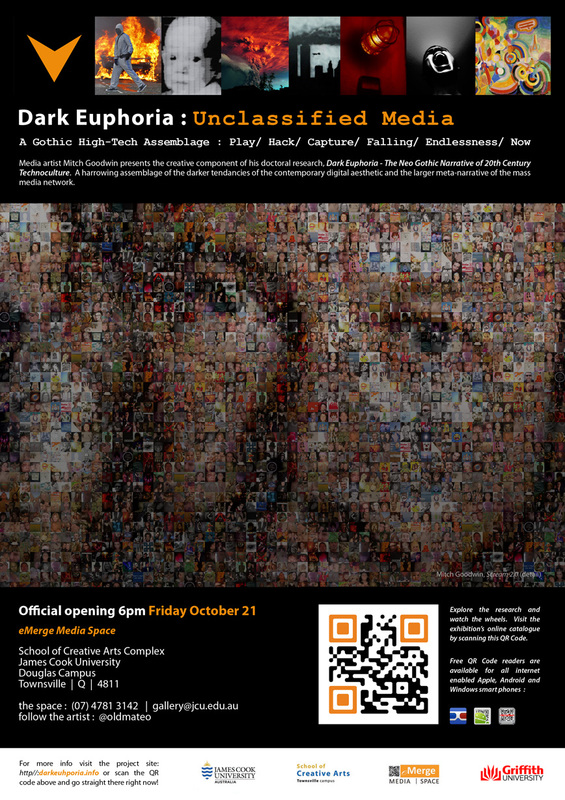 On Friday 21st October the exhibition, Dark Euphoria: Unclassified Media, opened to the public. 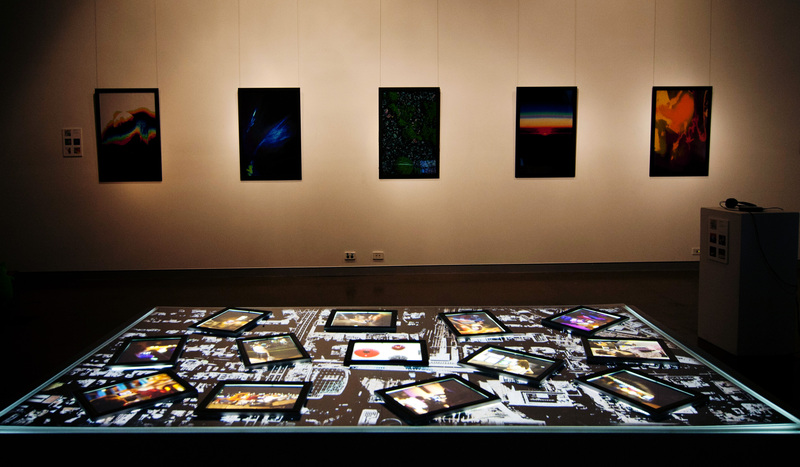 The exhibition will continue to run in the eMerge Media Space at James Cook University, Townsville until Friday November 4th 2011. The exhibition will re-open after the summer break on February 1st. Opening hours are Monday to Friday 9:30am – 4:00pm. Opened by School of Creative Arts Photo Media Lecturer, Adam Brown, the exhibition was well attended by staff, students and local media arts enthusiasts many of whom appear in the images below. I would particularly like to thank Vicki Salisbury and Aaron Ashley (Umbrella Studios), Eric Nash and Jak Henson (Perc Tucker Regional Gallery), Dr Sally Breen (Griffith University), Bernadette Ashley (Townsville Bulletin Arts critic), Jo Lankester (Brush and Press Studio) and Creative Arts Head of School Prof Ryan Daniel (JCU) for coming out in support of my work. The event could not have happened on time and in the manner in which it did without the valuable support and expertise of the eMerge Media Space team: Richard Gillespie and Ben Van Houts. And I would especially like to thank Elly Murrell for her ongoing support and belief in my work and this journey.